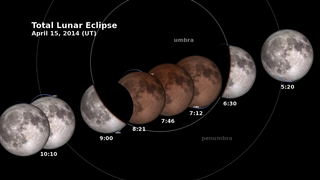 Graphic of the April 15 lunar eclipse, by NASA scientist Noah Petro. Image courtesy of NASA. A full eclipse of the moon will occur overnight, visible in the Western hemisphere for three hours from late Monday April 14 (in western time zones) and early Tuesday April 15 (in the east). The United States National Aeronautics and Space Administration (NASA) will stream a live feed of the eclipse, here, for some three hours starting at 2 a.m. EDT. The peak of the eclipse — when the moon enters the Earth’s full shadow or umbra — will occur at 3:45 a.m., said NASA. NASA’s animated productions of the eclipse, as seen from moon, are here. Like clockwork, the full Moon appears every month in our sky, a sight so familiar that we often take it for granted, but about twice a year, over the course of a few hours, the full Moon sports a decidedly different look. What causes this sudden change? A lunar eclipse occurs when the Moon passes through the Earth’s shadow, just as a solar eclipse occurs when part of the Earth passes through the Moon’s shadow. But the Moon circles the Earth every month as it cycles through its phases, lining up at both full Moon and new Moon. So why don’t eclipses happen twice a month? The reason is that the Moon’s orbit around the Earth is tilted relative to the Earth’s orbit around the Sun. Although the Earth and the Moon always cast long shadows, they rarely shade each other thanks to the Moon’s orbital tilt. But if that’s the case, why do eclipses happen at all? Throughout the year, the Moon’s orbital tilt remains fixed with respect to the stars, meaning that it changes with respect to the Sun. About twice a year, this puts the Moon in just the right position to pass through the Earth’s shadow, causing a lunar eclipse. As the Moon passes into the central part of the Earth’s shadow, called the umbra, it darkens dramatically. Once it’s entirely within the umbra, the Moon appears a dim red due to sunlight scattered through the Earth’s atmosphere. In fact, if you watched the eclipse from the surface of the Moon, you’d see the Sun set behind the entire Earth, bathing you in a warm red glow. Back home, you’ll have to stay up late to watch a lunar eclipse, but if you do you’ll see the Moon in rare form, and you’ll catch a brief glimpse of our own planet’s long shadow. This entry was posted in All, Current Affairs, Gyroscope and tagged " NASA, eclipse, Moon.